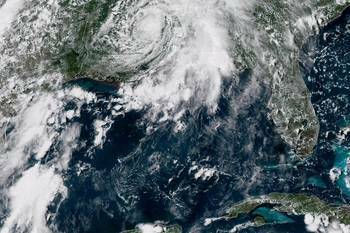 Tropical Storm Gordon forced a cut of 9.36 percent of crude oil production in U.S.-regulated areas of the Gulf of Mexico, slightly more than Tuesday, the U.S. Bureau of Safety and Environmental Enforcement (BSEE) said on Wednesday. Natural gas output in the northern Gulf of Mexico was cut by 10.39 percent on Wednesday, down another 1.33 percent from Tuesday, BSEE said. A total of 159,085 barrels per day (bpd) in crude oil production was shut on Wednesday, an increase of 2,178 barrels from Tuesday, the agency said. BSEE also said 266.08 million cubic feet per day (mmcfd) of natural gas output was shut on Wednesday in the Gulf, an increase of 34.08 mmcfd from Tuesday. Forty-eight production platforms in offshore production area remained evacuated on Wednesday, six fewer than on Tuesday.